It should come as no surprise that my love for savoury food outweighs my desire for sweets. This is especially true for cupcakes as for the life of me, I cannot understand why they are so expensive. On that note, I willingly shell out $3.00+ dollars per macaron all the time. Go figure... 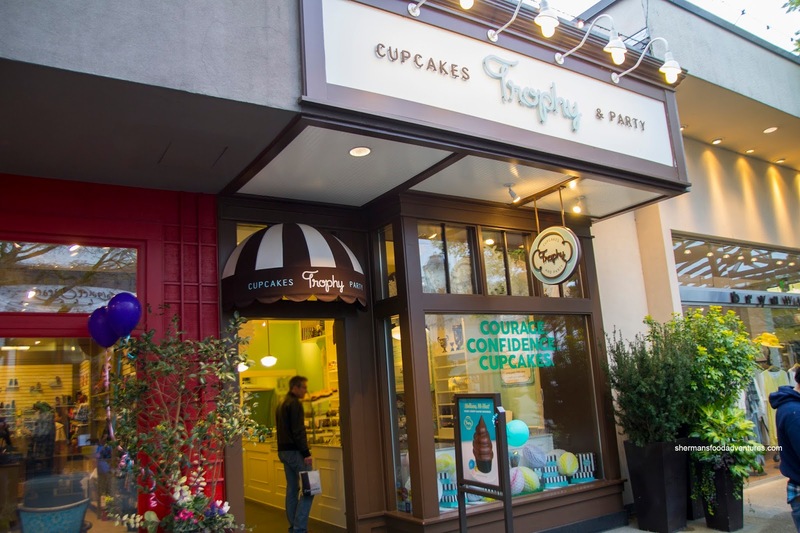 But when Lola encouraged me to pickup some cupcakes from Trophy (this was after others have said the same in the past), I thought this was finally the time I did so. Hence, after Caliburger, we made our way to University Village Mall to get a dozen of these pricey gems. 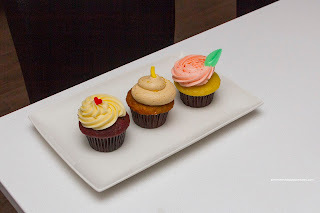 We ended up one each of their available flavours including the 2 massive-looking ones in the middle. These High Hats available for Easter were comprised of chocolate cupcakes filled and topped with marshmallow and coated with chocolate. This was a meal in itself where the cupcake itself was moist while being pretty sweet especially with the marshmallow and significant amount of chocolate. Too bad the box had squished the top of the tips as they looked funny as a result. I personally liked the Elvis the best (candy banana on top) with its banana, pineapple and coconut bread base and peanut butter cream on top. The shredded coconut in the cake wasn't necessary in my opinion as it interfered with the gentle texture. Although there was definite sweetness here, it wasn't overwhelming. As much as the Strawberry Lemonade sounded great, it was the least favourite of bunch. We found it too sweet and the expectation of tang never materialized. The Red Velvet was solid being lightly chocolatey while the cream cheese frosting on top was not crazy sweet where we could taste the cheese. 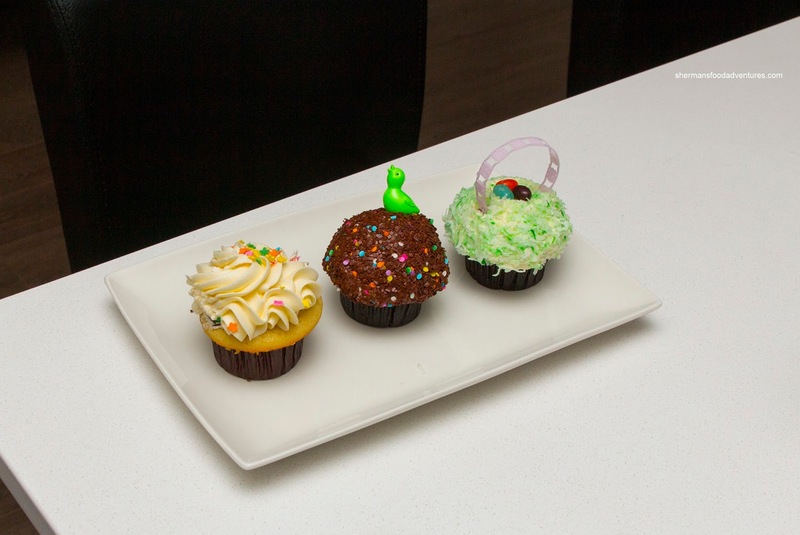 The next 3 cupcakes were the Vanilla Vanilla, Triple Chocolate and an Easter-themed Triple Coconut with shredded coconut frosting. The most interesting and impactful of the bunch was definitely the triple chocolate (which was aptly named). Soft, moist and rich in chocolate, the cupcake benefited from only a conservative amount of chocolate frosting (compared to the others). Also chocolaty, the triple coconut featured shreds in the cake and on top of the coconut cream. As for the vanilla, it was well, good, but nothing really all that interesting about it, hence being vanilla... However, the Madagascar bourbon vanilla buttercream did have a je ne sais quoi quality about it. 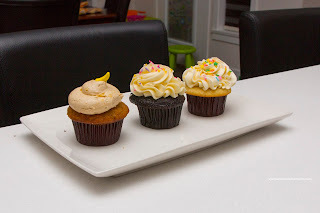 The last 3 cupcakes in the picture were essentially repeats other than the middle Chocolate Vanilla. As with the other chocolate-based cupcakes, they used Valrhona chocolate and topped with the same buttercream as the vanilla cupcake. Again, I prefered the triple chocolate more since it had a bittersweet Belgian buttercream and an extra dose of French chocolate sprinkles. 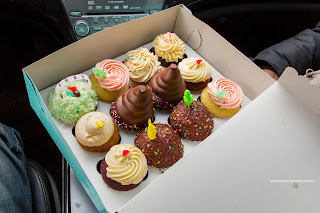 So the dozen of cupcakes set me back over $50.00, which makes these little treats pretty pricey. Were they worth it? I guess if you love cupcakes, yes. For me, they were good, but since I'm biased, I'm not sure if I would get another dozen. Maybe just a few including the Triple Chocolate.